Vienna has a habit of producing multifaceted artists active in a variety of fields. One such artist is Arik Brauer, who turned 90 in 2019. A major exhibition at the Jewish Museum honours the occasion. Some people seem able to achieve success wherever they turn their hand. Take Arik Brauer, for example. He’s known for his delightful answer to the question of how he came to become an artist: “I have always been a painter” (my translation). Painting, though, is just one of his many talents. Brauer co-founded the Vienna School of Fantastic Realism but also received a lifetime achievement award for his singing career. He’s danced in France, created sets for opera houses in Paris and Vienna, written a children’s book, designed buildings (including the famous Arik-Brauer-Haus on Vienna’s Gumpendorfer Straße), and put a man on the moon (possibly). The Jewish Museum’s Arik Brauer exhibition pays tribute to this Vienna-born creative genius, who reached the grand old age of 90 in 2019. The earlier parts progress chronologically, beginning with his childhood and family history before moving on through his time as a student, his travels, and time spent living in Paris and Israel. The later parts address particular themes, such as architecture, music, Brauer’s love of nature, or set and costume design. Photos, posters, instruments, furniture, and other items document his life and interests, while sculptures, paintings, costumes, and other works illustrate his artistic endeavours. The exhibition ties the two together rather nicely, showing how that life and those interests influenced (and influence) his art. Brauer stayed in Vienna during WWII as a child, avoiding the concentration camps by, for example hiding out in the city. His father, who initially fled to Latvia, and many others around Brauer, were not so lucky. An excerpt from the French film Les Distractions where Brauer and his wife appear as a musical duo in the background. I include that latter highlight simply because it seems a perfect illustration of a life well-travelled. After viewing the exhibition, the overall impression is also of a life well-lived. The displays left me nodding in appreciation of Arik Brauer’s talents, but also his ability to move past a childhood marred by war and the Holocaust to create such a life-affirming diversity of art in all its many facets. May he live another 90 years. 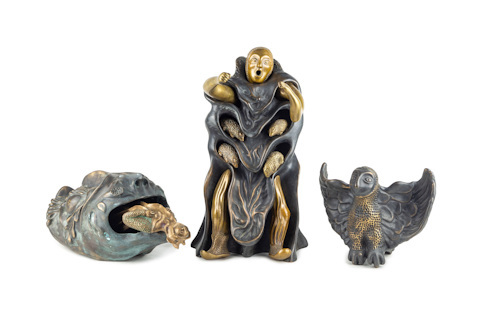 The Arik Brauer exhibition runs from Wednesday, April 3 to Sunday, October 20, 2019 in the Dorotheergasse location of the Jewish Museum. 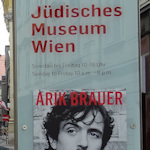 The museum’s main temporary exhibition space hosts the Brauer exhibits, so a normal ticket* to the museum gets you in (or use a Vienna Pass – see my review). See the tips on the Jewish Museum page.